France v. Germany: – A comparison of renewables vs nuclear power, and the ability to reduce carbon dioxide emissions. 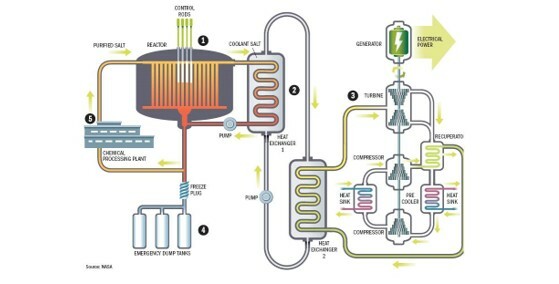 Thorium Reactors: the most Obvious Solution. We know how to build it now. Safety: But those concerns are exaggerated and over estimated. Compared to all sources of power generation, the nuclear accident record is low. Experience has made safety a high priority. Designers are now more than capable of building reliable plants with redundancies and fail-safe’s, and protection against human error. Similarly, dealing with nuclear waste is less expensive and more reliable than dealing with other forms of toxic industrial waste. Cost considerations do exist for creating new nuclear power plants. These can be addressed by making nuclear plants smaller and more reproduceable, or cookie-cutter-like. By manufacturing smaller, identical, nuclear plants in volume (as is done for automobiles or modular buildings), the average cost of new nuclear power can be dramatically improved. There just needs to be a will to invest in this technology. The earth has ample supplies of uranium. Nuclear power via fission is one of the most powerful bridges to other clean renewables, like the nuclear fusion of the future. A – Climate Change and the Nuclear Option – Download PDF. Germany has shifted electricity generation to renewables; close to 30% of all electric power today is from wind, solar, biomass and hydro. Germany is actively phasing out nuclear. Conversely, France has largely retained nuclear to date, with close to 70% of all electricity generated still coming from nuclear power. France has performed better in CO2 reductions over the last two decades, with a higher percentage reduction in emissions than Germany. This partly due to Germany’s need to add natural gas power plants, while battery storage for renewables remains too expensive. Thorium Reactors of the Future. from the wikipedia article on molten salt reactors. Challenges of commercial Thorium reactor design are: (a) to produce cost effective fuel and (b) to prevent corrosion of the reactor vessel (modern materials assist the latter goal). So, why don’t we have these safe Thorium reactors in operation today? Well, in the cold war of the 1960s, nations wanted massive amounts of Plutonium for massive nuclear weapons arsenals. Thorium nuclear power plants did not produce Plutonium, so they were abandoned. The decision to develop Uranium nuclear power technology exclusively (rather than develop safer Thorium as well) was the height of US, Russian and Chinese (& other nuclear nation) political stupidity. It was close to the stupidity and negligence now being applied to Climate Change by the majority of nations of the earth. Fortunately, several nations are designing 4th generation molten salt / Thorium reactors today, including China, the Netherlands, India and others. The USA has some initiatives by they are mired in regulations and lack of funding and lack of vision for this obvious solution to Climate Change. Horrific extreme weather will eventually cause both politicians and environmentalists to turn to nuclear power. See also: China Next-Gen Thorium nuclear reactor program, and the MIT Comparison of Fission / Fusion technologies.